영국의 하드 록 밴드 레드 제플린의 음반 목록은 정규 음반 9장과 싱글 15장, 영상 음반 3장, 컴필레이션 음반 9장으로 이루어져 있다. ↑ 가 나 다 “Artist Chart History: Led Zeppelin”. Official Charts Company. 2010년 12월 15일에 확인함. ↑ 가 나 다 “Extended Search: Led Zeppelin”. 《australian-charts.com》. Hung Medien. 2010년 12월 15일에 확인함. ↑ 가 나 다 “Extended Search: Led Zeppelin”. 《austriancharts.at》 (독일어). Hung Medien. 2011년 4월 5일에 확인함. ↑ 가 나 다 “Led Zeppelin Top Albums/CDs positions”. RPM. 2012년 10월 21일에 원본 문서에서 보존된 문서. 2010년 12월 18일에 확인함. ↑ 가 나 다 “French Chart” (프랑스어). infodisc. 3 November 2013에 원본 문서에서 보존된 문서. 2010년 12월 15일에 확인함. ↑ 가 나 다 “Musik-Charts durchsuchen: Led Zeppelin” (Enter "Led Zeppelin" in the search box). charts-surfer.de. 2011년 1월 25일에 확인함. ↑ 가 나 다 “Suche - Offizielle Deutsche Charts” (Enter "Led Zeppelin" in the search box). GfK Entertainment Charts. 2016년 5월 16일에 확인함. ↑ 가 나 다 “Extended Search: Led Zeppelin”. 《dutchcharts.nl》 (네덜란드어). Hung Medien. 2010년 12월 15일에 확인함. ↑ 가 나 다 “Extended Search: Led Zeppelin”. 《spanishcharts.com》. Hung Medien. 2010년 12월 15일에 확인함. ↑ 가 나 다 “Extended Search: Led Zeppelin”. 《norwegiancharts.com》. Hung Medien. 2010년 12월 15일에 확인함. ↑ 가 나 다 “Led Zeppelin - Chart history”. 《Billboard》. 2016년 5월 16일에 확인함. ↑ 가 나 다 “Allmusic -> Led Zeppelin -> Charts & Awards -> Billboard Albums”. AllMusic. 2010년 12월 15일에 확인함. ↑ “ARIA Charts—Accreditations—1999 Albums”. Australian Recording Industry Association. 2009년 10월 6일에 확인함. ↑ 가 나 다 라 마 바 사 아 자 차 카 타 파 하 거 너 더 러 “Certified Awards Search—Led Zeppelin”. British Phonographic Industry. 2011년 8월 26일에 원본 문서에서 보존된 문서. 2009년 10월 6일에 확인함. ↑ 가 나 다 라 마 바 “Gold Platinum Database: Led Zeppelin”. Music Canada. 2013년 6월 21일에 원본 문서에서 보존된 문서. 2011년 7월 10일에 확인함. ↑ 가 나 다 라 마 바 사 “The Official Swiss Charts and Music Community”. 《Hung Medien》 (독일어). 2011년 9월 17일에 확인함. ↑ 가 나 다 “NVPI de branchevereniging van de entertainmentindustrie” (네덜란드어). 8 October 2011에 원본 문서에서 보존된 문서. 2011년 9월 24일에 확인함. Note: User needs to enter "Led Zeppelin" in the "Artiest" field and click the "zoek" button. 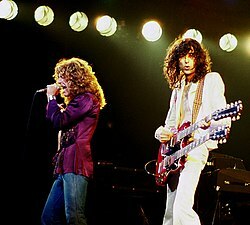 ↑ 가 나 다 라 마 바 사 아 자 차 카 타 파 하 거 너 더 러 머 “Gold & Platinum Database Search: "Led Zeppelin"”. Recording Industry Association of America. 2008년 9월 2일에 원본 문서에서 보존된 문서. 2009년 3월 26일에 확인함. ↑ 가 나 다 라 마 바 사 아 자 “French certifications—Led Zeppelin certifications search” (프랑스어). Syndicat National de l'Édition Phonographique. 21 June 2010에 원본 문서에서 보존된 문서. 2009년 12월 26일에 확인함. ↑ 가 나 다 “ARIA Charts—Accreditations—2007 Albums”. Australian Recording Industry Association. 2009년 10월 6일에 확인함. ↑ 가 나 다 라 마 바 사 아 자 REGION을 지원하지 않거나 비어 있습니다: Germany. ↑ 가 나 다 “IFPI Austria” (독일어). International Federation of the Phonographic Industry. 2010년 2월 1일에 원본 문서에서 보존된 문서. 2011년 9월 16일에 확인함. Note: User needs to enter "Led Zeppelin" in the "Interpret" field and click the "Suchen" button. ↑ “ARIA Charts—Accreditations—2006 Albums”. Australian Recording Industry Association. 2009년 10월 6일에 확인함. ↑ 가 나 Altman, Billy. “Led Zeppelin IV”. Amazon.com, Inc. 2011년 4월 6일에 확인함. ↑ 가 나 Fast, Susan. “Led Zeppelin”. Encyclopædia Britannica. 2011년 4월 6일에 확인함. ↑ 가 나 “ARIA Charts—Accreditations—2009 Albums”. Australian Recording Industry Association. 2009년 12월 27일에 확인함. ↑ “ARIA Accreditations of 2012 albums”. Australian Recording Industry Association. 2012년 12월 21일에 확인함. ↑ “IFPI” (스웨덴어). International Federation of the Phonographic Industry – Sweden. 11 February 2009에 원본 문서에서 보존된 문서. 2008년 6월 6일에 확인함. ↑ “The Official New Zealand Music Chart (24 December 2012)” (PDF). 2012년 12월 26일에 확인함. ↑ “CD Diamond”. Polish Society of the Phonographic Industry. 18 April 2012에 원본 문서에서 보존된 문서. 2013년 1월 3일에 확인함. ↑ “IFPI Norsk platebransje”. 24 July 2011에 원본 문서에서 보존된 문서. 2008년 8월 31일에 확인함. ↑ “ARIA Charts—Accreditations—2008 Albums”. Australian Recording Industry Association. 2009년 1월 6일에 확인함. ↑ The fourth Led Zeppelin album was untitled and is generally known as Led Zeppelin IV. It is also referred to as Four Symbols, Runes, Untitled and Zoso. ↑ The liner notes for the Led Zeppelin Boxed Set 2 and the label attached to The Complete Studio Recordings boxed set categorise Coda as a studio album. ↑ Celebration Day was released on CD, DVD and Blu-ray on 19 November 2012. The vinyl edition was released on 12 February 2013. 이 문서는 2018년 7월 22일 (일) 07:23에 마지막으로 편집되었습니다.